The tributary influence variable represents the potential influence of tributary and coastal watersheds on coastal and nearshore zones. This variable was computed by first calculating the contributing watershed area of each tributary or coastal segment. Three classes of the tributary influence variable were used, based on tributary catchment area (Minns and Wichert 2005; Allan et al. 2013): low (< 30 km2, mean size of first and second order tributaries); moderate (30- 250 km2 , representing third and some fourth order tributaries), and high (> 250 km2 , representing ≥ fourth order tributaries). This variable is developed for the nearshore zones only, and offshore zones were assigned a value of “0”. The relative tributary size was then propagated into the lake based on a mathematical distance decay function weighted by depth. The decay equation assumed 10% of the initial flow value persisted at 15 km from the river mouth and 1% at 30 km distance (Allan et al. 2013), but was modified to weight distance by depth to allow the load to move more easily through shallow waters (< 5 m) and become entrained in the nearshore zone (Makarewicz et al. 2012). For the tributaries, the distance was calculated from the pour-point of each river mouth; for the coastal segments without tributaries, the distance was from the midpoint of the entire interfluve shoreline. 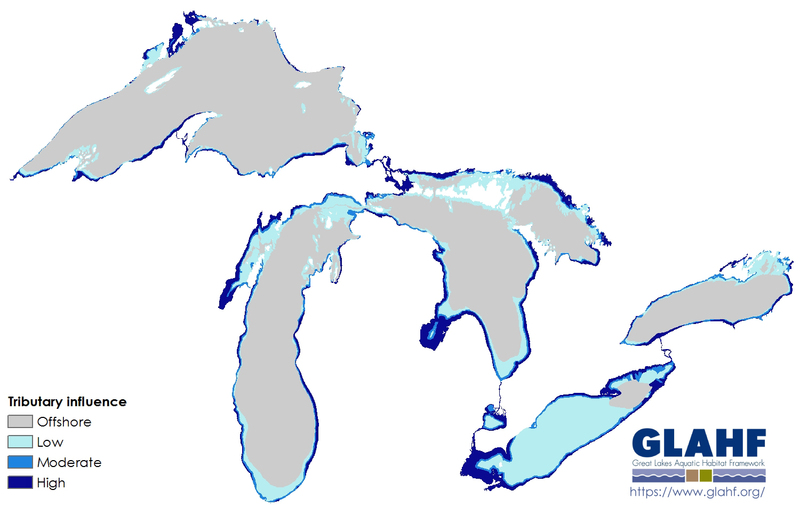 To capture the flow of the connecting channels, we assigned an estimated watershed area based on the proportion of major contributing watersheds for each connecting channel (St. Marys, North Channel, St. Clair, Detroit and Niagara Rivers). For St. Marys, Detroit and Niagara Rivers we captured the influence of the contributing lake by further scaling it to the mean flow.